Q. Are rituals part of Yogic lifestyle? Dr. J: In a way, some of them are. Repeating certain thoughts, mentally going over them, these are all Mantras that are very useful. Smt. H: Yes, as I explained earlier, Yogic lifestyle has certain rituals. But we also have a duty towards society, nation and humanity. If it is a good day for another person, we should also share in the joy. Be happy in others’ happiness – Mudita. Maitri – friendliness, compassion, these are all Yogic qualities and their expression in a gentle way is good. Q. I am not clear about the difference between rituals and routines. Can you please explain? Dr. J: Routines are sometimes done mechanically, without understanding. But when they are done with understanding, then they turn their meaning and become rituals. Smt. H: Routines are mechanical – we are brushing our teeth but thinking of other things, having our food but watching TV at the same time. But we convert them into rituals when we do them with feelings and surrender to the will of God. This makes them more enjoyable. Q. I have asked this question to many people that I am an Atheist. I don’t believe in God. Please tell me when we say, believe in a higher reality, what is the object of a higher reality? Dr. J: The object is that there is something larger than us in the universe, whatever name you give it and you want to believe in that, repeat that idea, experience that inner quiet peace and all these things do good to us. Smt. H: It’s always better not to have a very rigid, strong opinion. ‘I am an Atheist’ – this thinking itself, where the ‘I’ becomes strong is wrong. In yoga it is said that higher reality means that there is something higher than you. Before us the world was there and after us also the world will remain. And nothing will change just because we are not there in the world. Our existence is meaningful only for our own self. So this feeling that there is something larger than me, is what is required. Now whether you call it God or not, it doesn’t make a difference. In yoga also, ‘Ishwarpranidhanadva’ – ‘Dva’ is used which means, you want to believe in God then believe, if you don’t, don’t believe but surrendering is required. Accepting and do your part. Surrendering to your boss, situations, Nature, etc. If an earthquake happens, what can you do, you have to accept. So you have to believe that there is something higher than you. That’s very clear. Q. Due to study pressure, my daughter follows a ritual of sleeping by 2-3am and wakes up by 7am. How can I make her understand that this ritual is not good for her? Dr. J: You need not make her believe that this is a ritual. It is just a habit and habits can be formed and broken. Gradually new habits can be formed. Smt. H: Everyone finds their own comfort zone and what helps them study better. If your daughter is studying well and can produce her answers well without any tension or worry, then she has found out her own way. But if, inspite of wrong routines, she still can’t study, then make it very clear that early to bed and early to rise is good for health. And if a person is healthy, the mind also would work better and the situation would be better. So you don’t have to be after her if she is a grown-up girl, but if there are no exams, at least she can follow healthy routine. 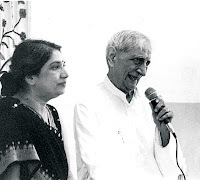 Q. Shata Karma – death anniversary; is it a must? Dr. J: See, the word should not be understood like that. Shata means hundred – hundred actions. It depends, a person has decided on a hundred actions, if they are done with good intentions, then they are okay. Smt. H: According to yoga and Jainism also, once a person dies, you just forget him and leave him, don’t think about anything. In any case, the person is alive in the mind, they have only changed their name and form. So now remembering them with the same name doesn’t make any sense. At least we would not recommend that, but if on that specific day, family members are coming together and doing something positive, it is okay. If you can pick up something positive from that, it is okay, otherwise it doesn’t make sense.